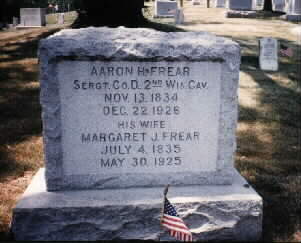 Born at Hudson, Wisconsin, October 24, 1861, the son of Aaron H. and Margaret J. Frear. He served in the Army Signal Corps for five years. He received his LL.B degree at National Law University and practiced law at Hudson, 1884. He served as City Attorney for several terms of office. He was appointed District Attorney, St. Croix County, Wisconsin, and was re-elected for two additional terms, 1897-1901. He was elected a member of the Wisconsin State House of Representatives, 1902 and to the Wisconsin State Senate, 1904. He was Chairman of the Wisconsin Legislature Insurance Investigation, 1906. He was Wisconsin Secretary of State, 1907-13. He then served as a Member of the 63rd to 72nd Congresses (1913-33) from the 10th Wisconsin District and the 73rd Congress (1933-35) from the 9th Wisconsin District. He was a Republican and a resident of Hudson, Wisconsin. 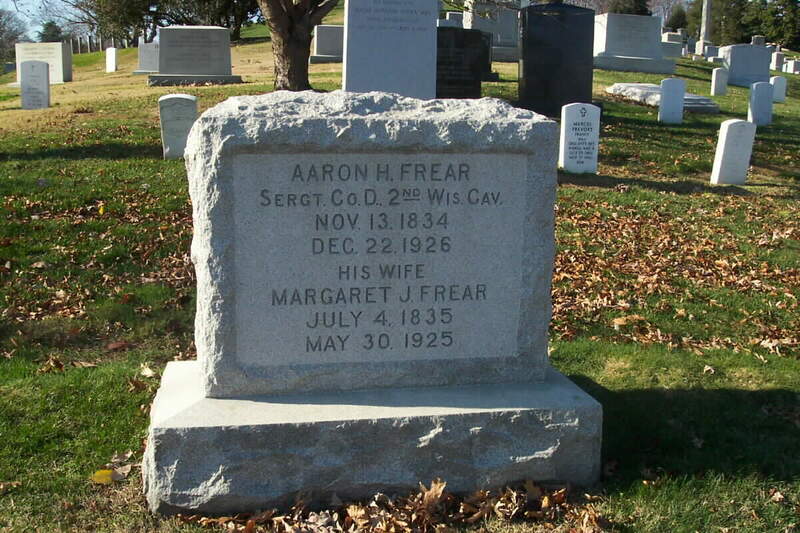 Following his service in Congress, he practiced law in Washington, D.C. where he died on May 28, 1939. He was buried in Section 2 of Arlington National Cemetery. 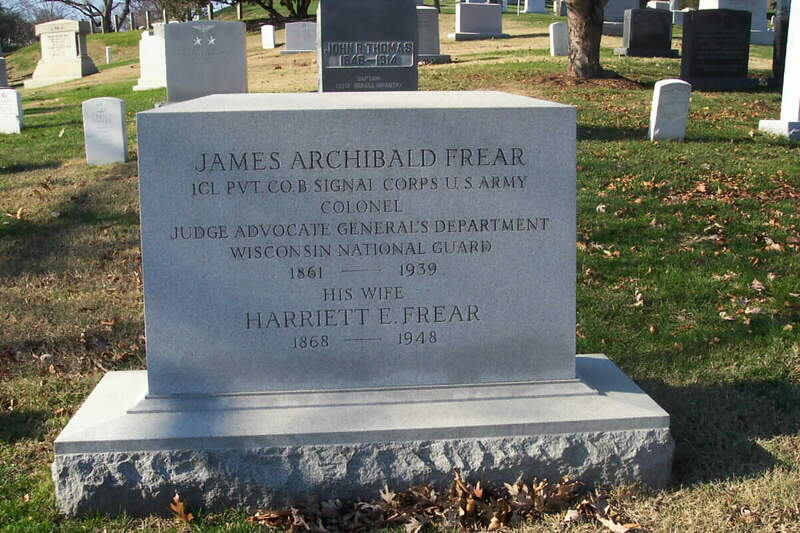 His wife, Harriet E. Frear (1868-1949), is buried with him, as are his father, Aaroh H. Frear, Sergeant, Company D, 2nd Wisconsin Volunteer Cavalry of the Civil War (Novemebr 13, 1834-December 22, 1926) and his mother, Margaret J. Frear (July 4, 1835-May 30, 1925). 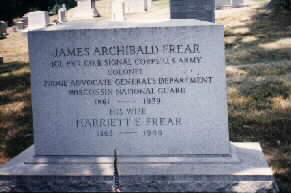 FREAR, James Archibald, a Representative from Wisconsin; born in Hudson, St. Croix County, Wis., October 24, 1861; attended the public schools, and Laurence University, Appleton, Wis., in 1878; moved with his parents to Washington, D.C., in 1879; served in the Signal Service, United States Army, 1879-1884; was graduated from the National Law University, Washington, D.C., in 1884; was admitted to the bar the same year and commenced practice in Hudson, Wis.; city attorney of Hudson in 1894 and 1895; served eleven years with the Wisconsin National Guard, retiring with the rank of colonel and judge advocate; district attorney of St. Croix County 1896-1901; member of the State assembly in 1903; served in the State senate in 1905; secretary of state of Wisconsin 1907-1913; elected as a Republican to the Sixty-third and to the ten succeeding Congresses (March 4, 1913-January 3, 1935); was not a candidate for renomination in 1934; resumed the practice of law in Washington, D.C., where he died May 28, 1939; interment in Arlington National Cemetery.